THIS ATTRACIVE LADIES QUARTZ WATCH WAS MADE IN JAPAN BY SEIKO. IT IS MARKED ON THE BACK SEIKO BASE METAL ST. STEEL BACK. 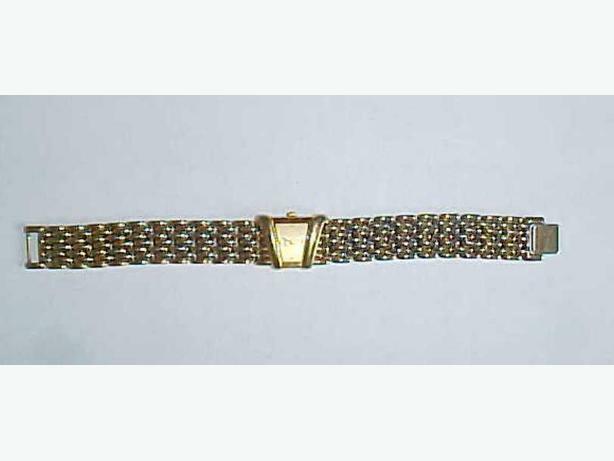 THE MODEL NUMBER IS 4N00-574A.THE OVER ALL LENGTH OF THE WATCH AND BRACELET IS 18 CENTIMETERS. THE WATCH IS IN VERY GOOD CONDITION AND KEEPS TIME WELL. THE BATTERY IS NEW.